In the past we’ve spoken about remote control cars and rc helicopters but how about remote controlled movie characters?? Well, Buzz Lightyear, as many will know, is the famous character from the Toy Story movie that was originally released back in 1995. Now, 15 years later, you can get hold of your very own (or for your kids of course) Buzz Lightyear remote controlled toy. 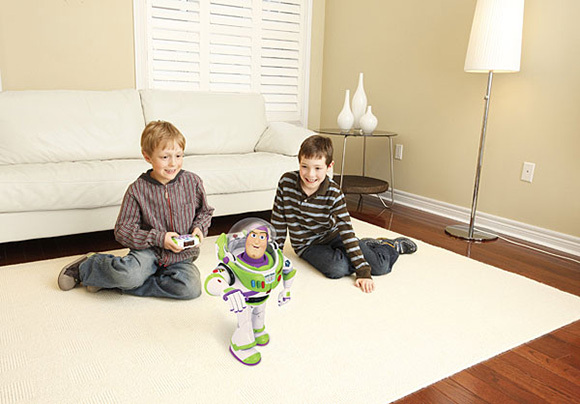 The Buzz Lightyear remote controlled toy measures approximately 16″ in height and is fully programmable allowing you to control it’s hands, head, arms and legs. Sensors can be found on Buzz which can detect motion and sound as well as being able to respond to prompt commands found in the users manual. Its already widely available at many stores including Toys-R-Us and Amazon priced at somewhere in the region of $130 – $150.